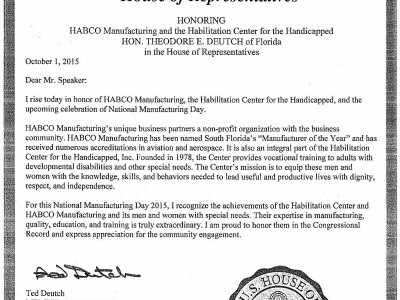 The Habilitation Center in Boca Raton is well known for the exemplary vocational training programs and support services it’s been faithfully providing adults with cognitive, emotional, and physical disabilities since 1978. What many don’t realize is that its seven-acre Plant nursery, which is both a dynamic training operation and a vital enterprise, is one of the largest bedding plant nurseries in Palm Beach County, with annual production approaching 1 million plants. The Nursery recently hosted its Second Annual Open House in an effort to enhance awareness of the operation and its impressive array of stunning plants and to introduce existing and prospective customers to a new and exciting line of colorful plants for the Florida landscape. Among the many participants were Andrew Britten, director of Propagation and Technical Services with Total Growth Solutions- a division of Costa Farms; Earl Poppell, National Accounts Manager with S & G Flowers, which is the largest plant brokerage in the world; Doug Parkinson from Euro-American Propagations; and Bill Schall, Commercial Horticulture Extension Agent in Palm Beach County. Guests included the 2012 class of Leadership Boca, sponsored by the Greater Boca Raton Chamber of Commerce, who were touring the Center that morning as part of their Human Services Day. Please call (561) 483-4200 to learn more about the Center and its Plant Nursery or go to www.habcenter.org.